Managing your money in ways that help you build wealth and keep you from going into debt starts with a well-thought out plan. In many cases, the best way to begin that plan is by creating a budget. Where you spend, save, and divvy up your money greatly affects your life and finances, which is why establishing a budget is so financially important. Coming up with one budget can sometimes be a difficult task in itself. It’s not always clear or easy to figure out where every penny should go. That being said, you’re probably wondering why you’d ever go through the pain of creating and trying to stick to multiple budgets. Depending on your financial circumstances, however, multiple budgets can be extremely beneficial in correctly handling your money. Here are three scenarios where you might need more than one budget. A monthly budget is great if you get paid all at once, however, if you get paid every week or two weeks, you might not necessarily be able to rely on one monthly budget. I don’t know about you, but my bills and rent tend to come at different times of the month. If I received a paycheck once a month, it wouldn’t be difficult to factor those expenses in. However, getting paid every two weeks means that I’m factoring different expenses in to each separate paycheck. Furthermore, when you try to rely on one budget, you may find yourself running low in between paychecks. You may also find it difficult to create a steady bill-paying schedule if you’re constantly waiting on your next infusion of cash. This could then lead to you accruing late fees. It’s easy to forget about bills you still need to pay at the beginning of the month, which can give you the illusion that you have a surplus and cause you to spend more money that you don’t actually have. By creating a bi-weekly budget along with your monthly one, you’ll have a better idea of how your cash flow is moving instead of relying on a monthly overview. Another good rule of thumb is to put a little of each paycheck into an emergency fund so you’re always prepared for any curve ball life may throw at you. It’s still beneficial to have an overall view, but checking in on your income bi-weekly leaves you with less of a chance to forget something or overspend. Life tends to bring about big events and life changes, and generally, they’re changes that cost money. Sometimes, changing jobs to follow your passion or join the company you’ve always dreamed of working for can come with a pay cut. While a switch could be beneficial to your career and income in the future, it may not always be beneficial in the present. It’s easy to spend more as your income increases, however, if you’re taking a pay cut, your spending habits and budget will have to adjust to your new income level. Another change to consider would be if you plan on moving sometime in the near future. Moving is an expensive event that can cost you a small fortune depending on how far you’re moving. Even if you plan ahead, it may be a good idea to create a second budget leading up to and after the move: one that maybe cuts back certain expenses or entertainment costs until you’ve paid for the move. The same idea would be beneficial if you’re planning a wedding. Once the events are over and paid for, you can switch back to your normal monthly budget. In our current job market, it’s become the norm to move away from the traditional corporate job and career track. Many employees, of all ages, have moved to self-employment or freelance jobs. And some, even with a steady position, have begun to work creative jobs on the side to create a surplus of income. That being said, the budget for someone who works for themselves or receives extra income won’t always look the same every month. Anytime you have a fluctuating income, you have to account for months when you’ll have extra cash and months when you might be stretching your funds. If your income varies month to month, it’s a good idea to create multiple budgets for every possible scenario. Three different budgets can prepare you for every different route. Create a “bare bones” budget for those months your income is lower, an average one for the months your income stays fairly steady and within the norm, and lastly, create a budget for those months you receive more income than you normally would. It’s always a good idea to have a plan for any extra money you might receive, so it doesn’t go to waste on miscellaneous items. Creating three income-based budgets is also beneficial if you work a commission-based job as well. Although you have a steady salary, you’ll also have months where you exceed your normal income amount or have to live off a smaller paycheck. Creating a thorough plan for your income is the best first step for anyone looking to manage their money wisely. However, depending on your job, situation, and paycheck, not everyone’s plan is able to follow the same path. While a solid monthly budget or one budget works for some, for others, one budget could leave you in a less-than-ideal financial situation or cause you to waste income that could be put towards your financial goal. Whether your paycheck is divided, you’re preparing for a major life event, or your income varies by month, creating more than one budget can help you adjust your finances to your situation and prepare for whatever financial situation comes your way. Do you have more than one budget? 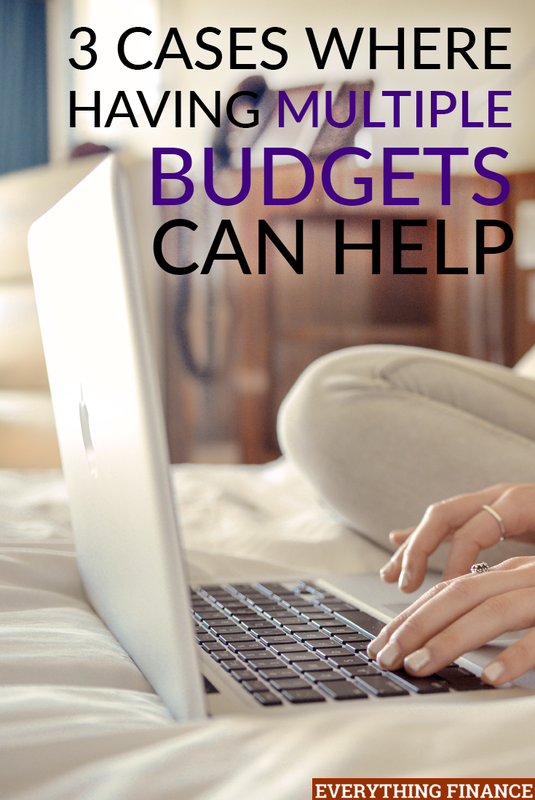 What have you found helpful when trying to follow more than one budget?